Located in Anne Arundel County, Glen Burnie is a suburb of Baltimore and home to a population of over 60,000. Residents of Glen Burnie, Maryland enjoy the comfort of the suburbs while only a short commute away from major cities such as Annapolis, Baltimore or even Washington, DC. Filled with a plethora of businesses and a reputable school district, Glen Burnie is an ideal location to settle down with your family. Cedar Square Homes is the ideal custom home builder for Maryland homeowners! Contact one of our expert representatives for more information about the benefits of our services. 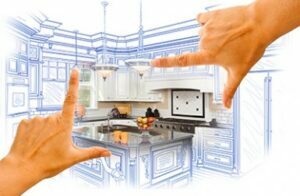 As the focal point of the home, the kitchen is highly influential and should be prioritized during home renovation. Kitchens are deeply ingrained into all daily routines and bring the family together throughout the day. From regular family dinners to annual holiday celebrations, all family events revolve around the kitchen. Remodeling your kitchen can be achieved with a variety of services, including interior painting, custom cabinetry installation, new tile flooring, and more. Upgrade your kitchen appliances such as the stove, oven, and refrigerator to increase the kitchen’s efficiency and boost the sophistication of the design. The Cedar Square Homes team builds new garages and remodels old garages to create extra space for our customers. Additional garage space can be used for storage or function as a workshop. Extend your garage space to protect both vehicles from the damage or reburnish the area for an innovative purpose, such as a home gym. The possibilities are endless thanks to the expert Cedar Square team. Our experienced crew has the vital skills to build your garage based on your specifications. Customized to your specific needs, our garages are made from the best quality materials. If you need a custom home builder in Glen Burnie, contact Cedar Square Homes today! Our team draws on decades worth of experience to complete a variety of tasks, from siding installation to home additions. Committed to quality results and excellent customer service, Cedar Square Homes is the best choice for the Glen Burnie community.